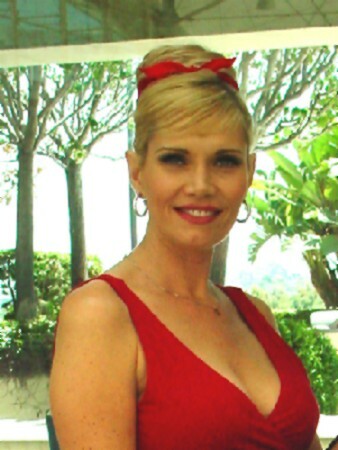 Perhaps one of the sweetest and kindest people to come do a signing at con this year was Lana Clarkson. Originally scheduled for just two days, she had such a good time that she asked about coming for the other two days as well. Everyone who I saw near her table was having a wonderful time and enjoying every second of it! As you can see to the right Lana did not just sign autographs and briefly chat with the fans, she took the time and energy to pose for photos and make memories that con goers will never forget! If ever anyone seemed to understand the importance of loyal fans, it is Lana, and she most definitely came out of her weekend in San Diego with more fans than she started. This entry was posted in Convention, Human Interest and tagged Amazon Women on the Moon, Black Scorpion, CCI, Comic-Con International, Lana Clarkson, Robert Pine, San Diego Comic-Con, SDCC on July 30, 2001 by Kay. 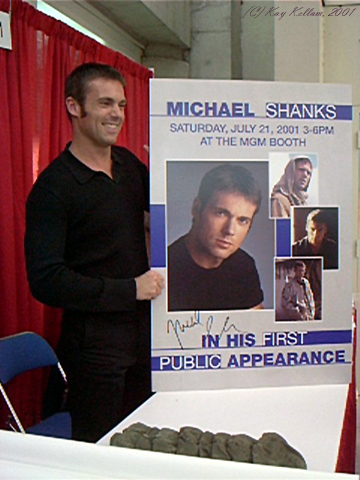 Michael agreed to pose with the poster announcing this as his first public appearance — which you’ll note he also autographed. This entry was posted in Convention and tagged CCI, Comic-Con International, Lightspeed Fine Art, Michael Shanks, San Diego Comic-Con, SDCC, SG1, Stargate, Stargate SG-1 on July 21, 2001 by Kay.